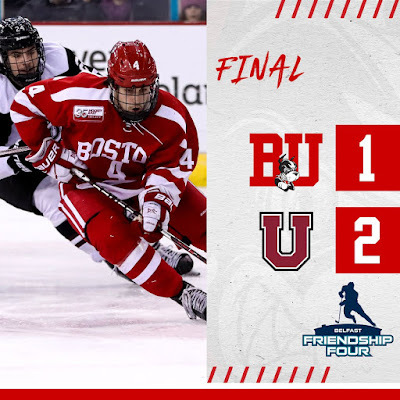 Terriers were edged by #11/12 Union in the championship game of the Friendship Four Tournament in Belfast. The Dutchmen held off a furious BU attack to produce an equalizer, with Union goalie and tournament MVP Darion Hanson stopping 39 shots, including a pair of five-bell saves in the final minutes. Ty Amonte, who had authored the game-winner in Friday’s victory, scored the lone Terrier goal and was named BU player of the game. BU nearly took the lead on its first shot when Patrick Harper’s backhander rang off the post. Union got on the board first midway through the opening period when Anthony Rinaldi’s wrist shot deflected off Brett Supinski and went over Jake Oettinger’s blocker. BU enjoyed a territorial and shot advantage throughout the period and finally tied the score late in the period. Dante Fabbro’s shot from the point was saved by Hanson as was Patrick Curry's follow-up attempt, but Amonte went to the net and backhanded the loose puck home. Terriers began the second period on a power play and again saw a near goal when Shane Bower’s deflection went off iron. Three-and-a-half minutes in, a defensive miscue allowed Union’s Parker Foo to skate into the BU zone on a 2-on-1. He held the puck until he reached the bottom of the right circle, then wristed it past Oettinger high to the short side. Both goalies were forced to defend against extended periods of attack time, in part due to the large, Olympic-size sheet, and the contest remained at 2-1 into the third period. With about four minutes left, co-captain Bobo Carpenter gathered a loose puck in the slot and backhanded the puck toward a seemingly open left side of the cage, but Hanson lunged with his right leg to knock the puck away. With just over a minute remaining, BU pulled Oettinger, but Union was able to clear the puck twice, both resulting in icing. In the waning seconds, Hanson robbed Amonte’s attempt from outside the right post, one of three critical saves he made in the final minute. Oettinger, who was BU’s player of the game on Friday, stopped 36 shots, keeping BU within striking distance in the final two periods. 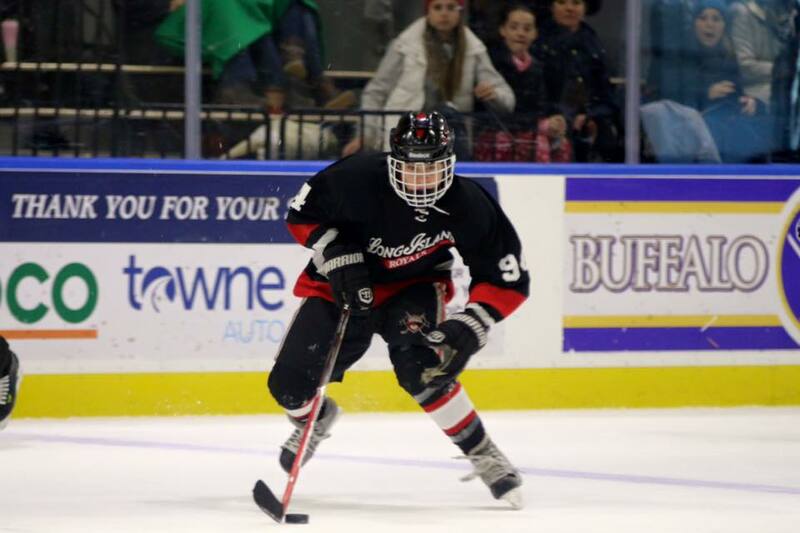 2019 recruit Robert Mastrosimone scored his team-leading 10th and 11th goals in USHL Chicago’s 4-2 win against Central Illlinois. Mastrosimone, who had joined the NTDP U18s in the recent Five Nations Cup, has been named to the US Junior Select team that will compete in next month’s World Junior A Challenge.